OSAKA (Kyodo) -- Osaka Toin defeated Mie 4-3 in the final to win the prestigious national high school championship on Monday. 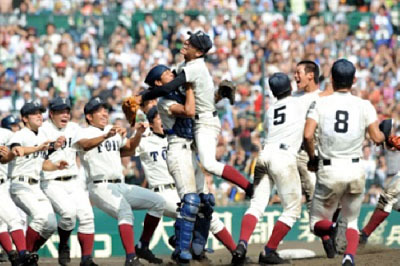 Osaka Toin trailed 3-2 in the seventh inning, but with two outs and the bases loaded, Makoto Nakamura singled in two runs to help his team take its first championship since 2012 and fourth overall. Osaka Toin starter Kosuke Fukushima got himself out of a jam in the ninth to pitch a complete game. Mie had twice taken the lead, Kengo Nakabayashi making it 2-0 with a two-run double in the second and Toma Utsunomiya making it 3-2 in the fifth, but could not hold on for its first title.